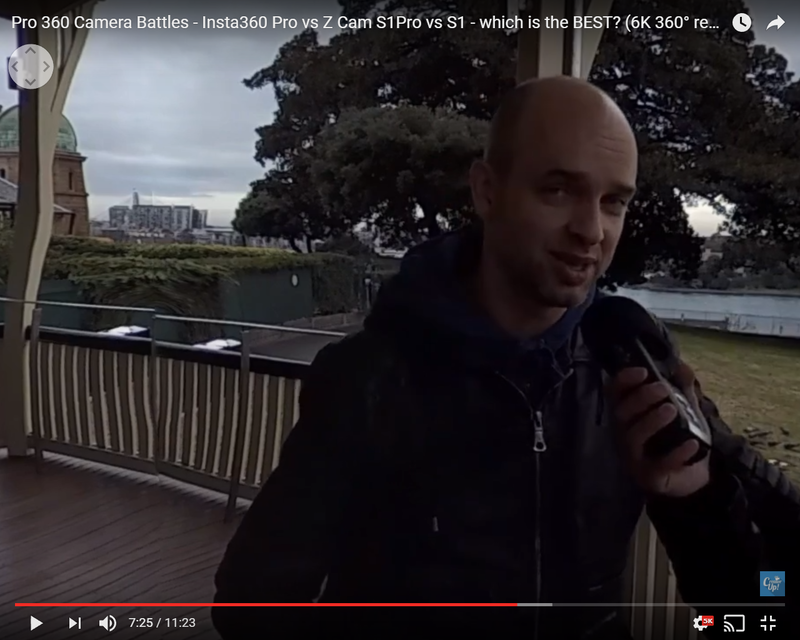 CreatorUp’s Hugh Hou and Grainger VR’s Maxim Drygin compared three popular professional 360 cameras: the Insta360 Pro (my review here), Z Cam S1 and Z Cam S1 Pro. Here are my observations from the comparison. 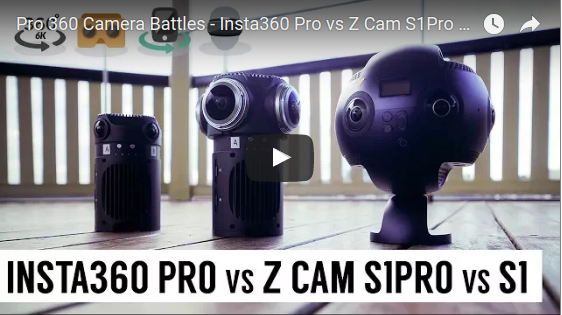 I’ve also listed the differences in specifications and features between the Insta360 Pro and the Z Cam S1. To compare these three cameras, Hugh and Max recorded videos from each of these three cameras in a challenging scene that posed several issues, with repeating patterns, high dynamic range, and some objects very close to the camera. 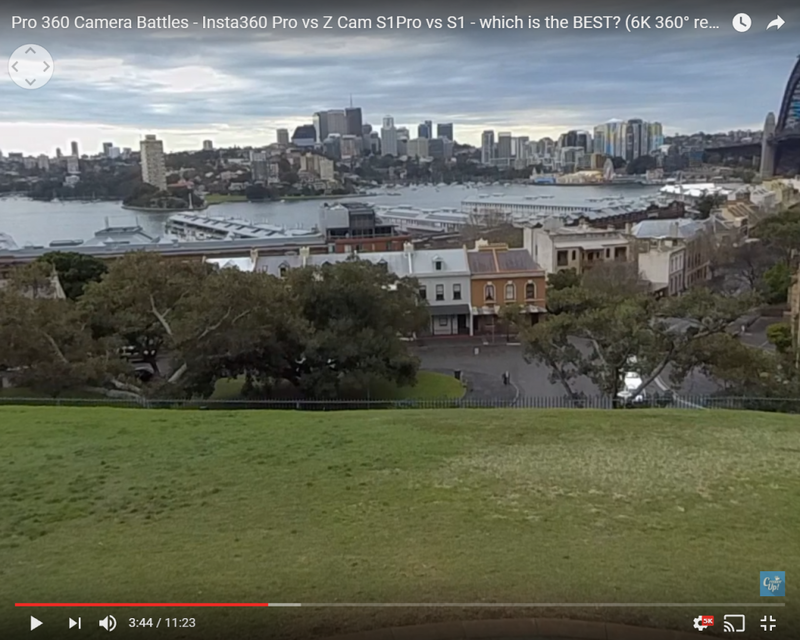 From this sample it appears that Insta360 has the most detail (noticeable in the trees in the foreground and especially noticeable at distant objects such as the buildings across the bay). The Insta360 is followed by the S1 Pro, then the S1. 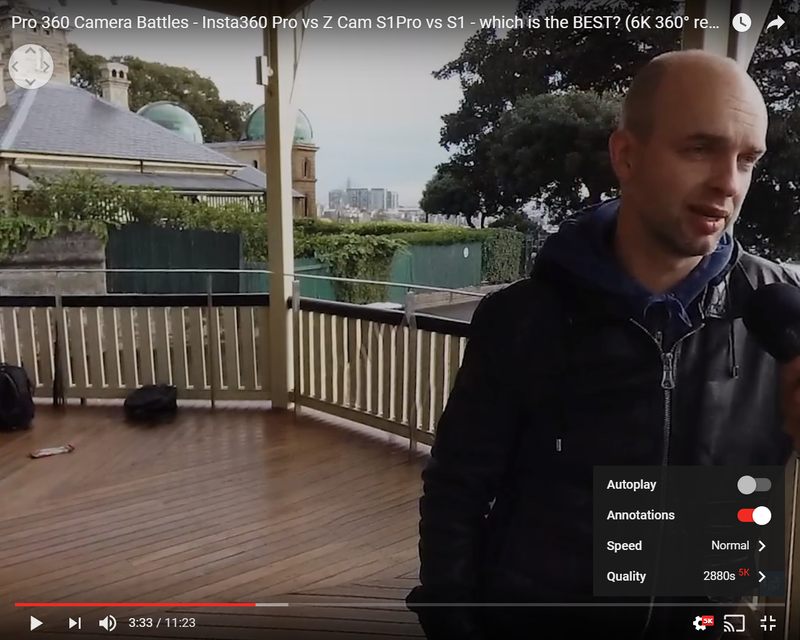 In fact, this is not the full resolution of the Insta360 because even though Insta360 Pro was shot at 8K for this test, it was downscaled to 6K for this test. Furthermore, consider than the Insta360 Pro can shoot in 3D, which neither Z Cam can do. 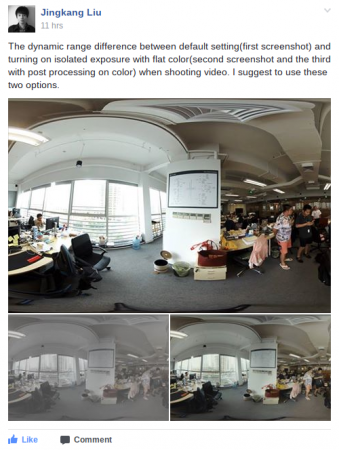 In the shots above, the Insta360 Pro appears to be exposed for midtones, whereas the Z Cams were exposed for highlights (so they look underexposed compared to the Insta360 Pro). 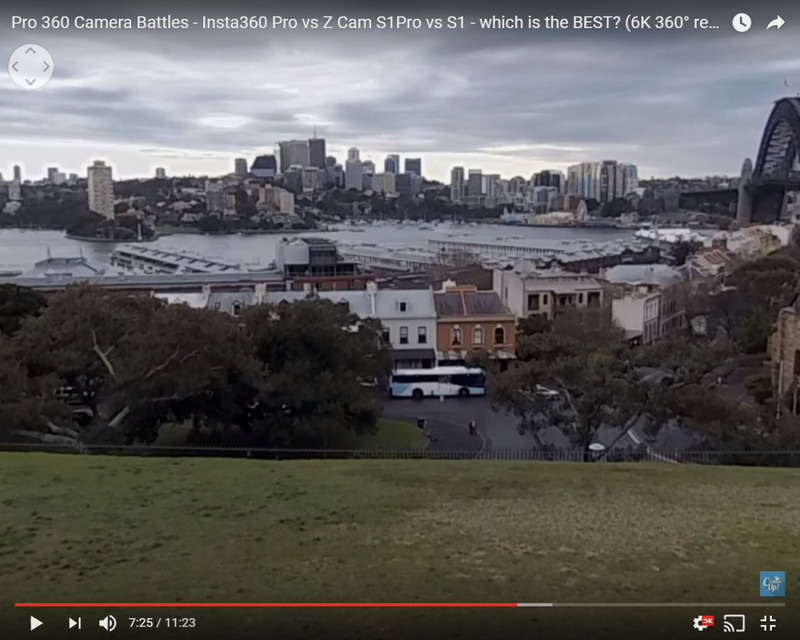 Nonetheless, it would seem from the appearance of the sky in these samples that the Z Cams have greater highlight range than the Insta360 Pro. In response, Insta360 CEO JK Liu pointed out that Insta360 Pro’s dynamic range is at a minimum at the default auto exposure settings. Instead, to maximize dynamic range, two features could be used: flat color mode (similar to log mode) and/or isolated exposure mode (which adjusts the exposure independently for each lens). Note that the Z Cam also has flat color mode and can also set exposure independently per lens. Due to the difference in exposures and possibly the rendering, this test seems somewhat inconclusive as to the dynamic range, although for now it seems as if the Z Cams might have more highlight range if comparing auto exposure and default settings. Comparing only the stitching quality based on the software for each camera, Hugh said the Z Cameras had much better stitching (note: Insta360 is updating their stitching algorithm). To remove the software as a factor, Hugh compared videos from each camera when stitched by the same software, Mistika. 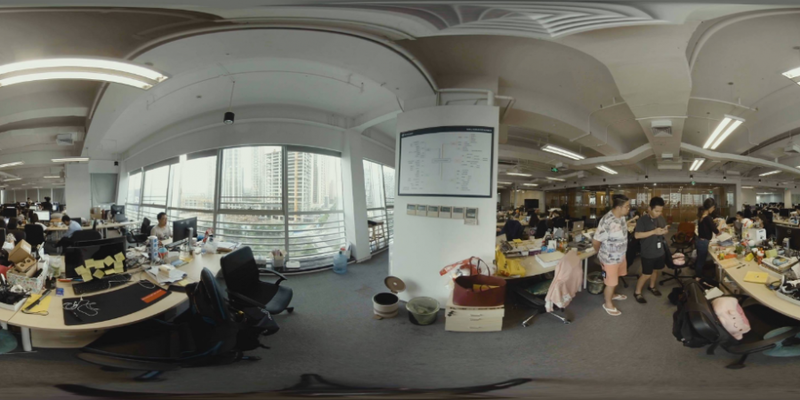 When all three are stitched with Mistika, the smoothest stitch appears to be that of Insta360 Pro. 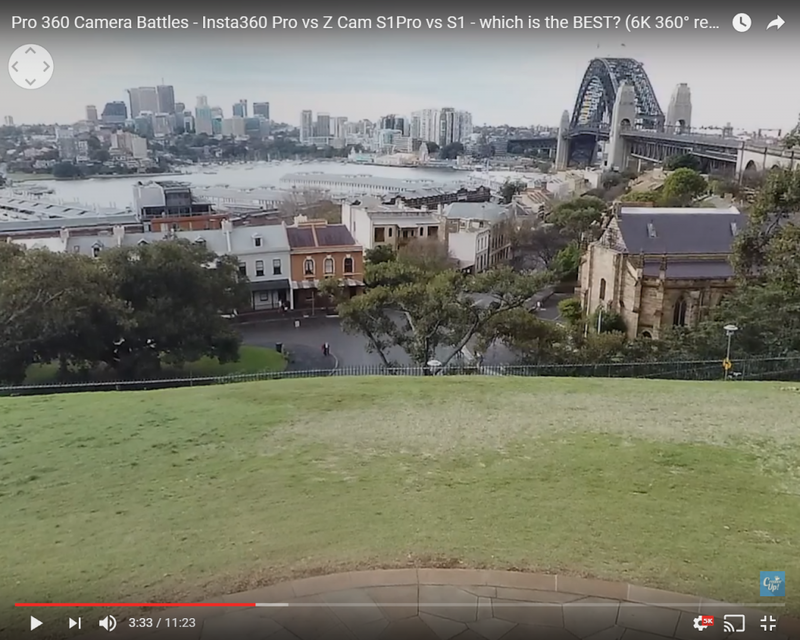 Insta360 Pro has a larger distance between its lenses, which normally leads to greater parallax stitching error, but stitching quality is also affected by the amount of overlap between lenses, and Insta360 has much greater overlap compared to the Z Cameras. In fact, on the Insta360 Pro, every part of the image (other than zenith and nadir) is captured by 3 lenses. 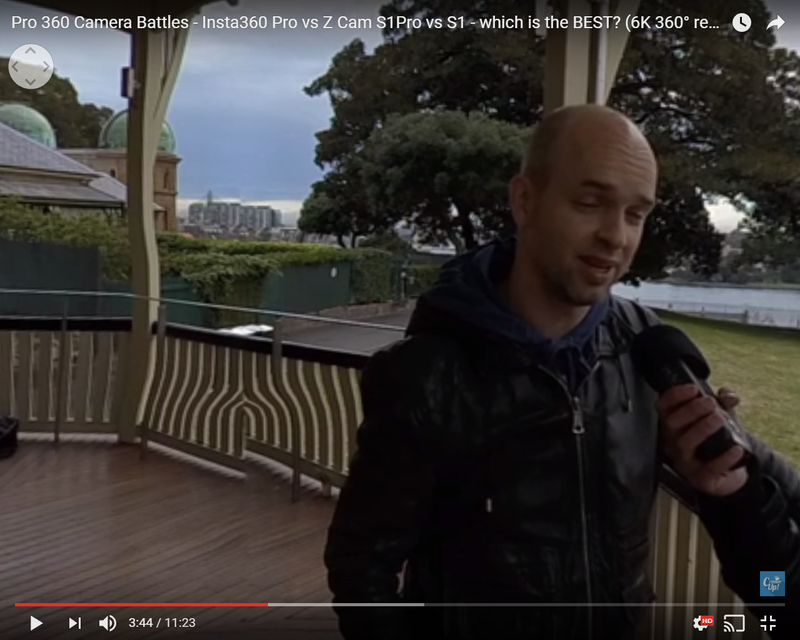 I also compared the specifications and features of the Insta360 Pro and the Z Cam S1. 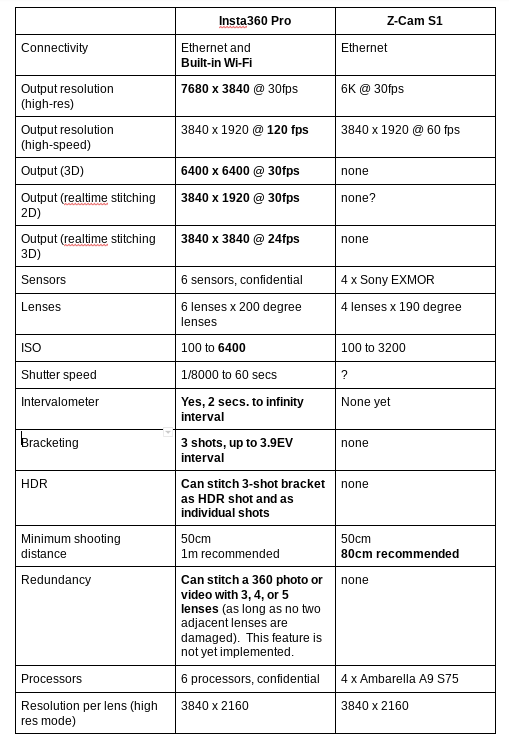 Here are the differences that I found (I didn’t include specifications or features that were the same or similar for both, such as having genlocked sensors). I highlighted in bold any advantages that I found for either camera. What do you think of the results of the comparison? 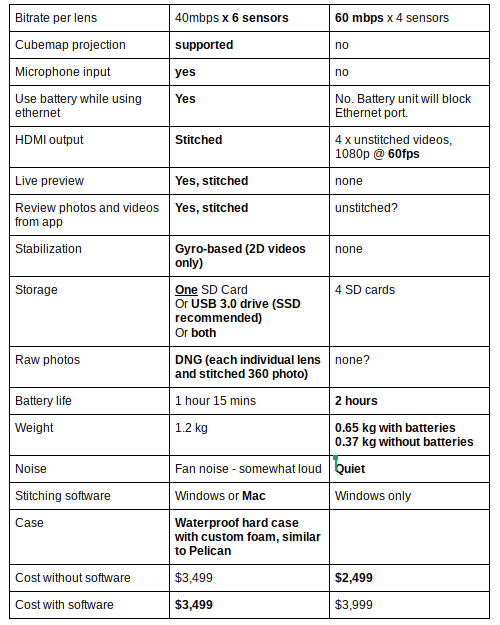 How about the differences in the specifications and features? Are there any specs that I missed and should be included in the chart? Pls. let me know in the comments! If you want to buy Insta360 Pro, please contact me via the contact page in the navigation bar above, or through www.Facebook.com/360rumors so I can tell you how to get a special discount! Or if you are in a hurry, you can get it through Amazon or B&H Photo. Z Cam S1 is available here. Z Cam S1 Pro is available directly from Z Cam.